On 18 June 1815 the final battle of the Napoleonic Wars took place at Waterloo, ending in defeat for Napoleon, who abdicated for the second and final time four days later. The Allied victory over the French in 1815 established the United Kingdom as the most powerful political and military nation in Europe, a position it was to hold for most of the nineteenth century. 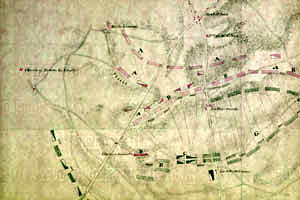 The map here is a contemporary sketch of the battle showing the positions taken by the Allied and French forces.